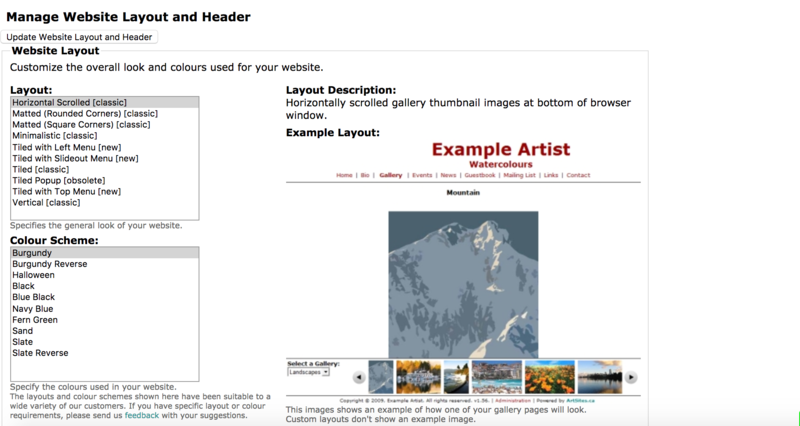 ArtSites was built to allow you to create a website that works best for you and your art work. A big part of that is selecting a layout and color scheme that highlights your work. In this tutorial, we'll show you how to change your layout and select a new color scheme. As you click, you will see the Example Layout on the right-hand side change. This helps give you a general idea of what each layout and colour scheme looks like. You can then, select a color scheme from the 'Colour Scheme:' box. Color schemes are tied to specific layouts. By default, the Example Layout shows the first color scheme. However, click on other color scheme choices to see additional options. When you are done, click on the 'Update Website Layout and Header' button to save your changes! You can now go to your website to see how the new layout looks. You can change your layout and colors at any time. In fact, we have some artists who change their layout and colors depending on the time of year. Have fun and experiment knowing that all your content will automatically be formatted to work with the new design and colors.